Main image: Here I am pictured centre, looking sheepishly short amidst the budding models and designers at yesterday’s Reinvent Fashion Awards at Griffith College. Yesterday I played judge at Griffith College Dublin’s Reinvent Fashion Awards, the much-loved annual competition among secondary school students where transition, fifth and sixth year students were challenged to design and construct a ladies outfit from second hand garments. More than 200 students were in attendance at the event and 40 designs from budding fashion designers were modelled on the runway for the panel of judges which consisted of myself, Rebecca Morgan, of Morgan The Agency modelling agency and Jane Leavey, Course Director of the BA in Fashion at Griffith College. The design and inspiration boards included moods ranging from The Great Gatsby to 30s style and haute couture and they really showed off the amount of effort that went into each creation, which at times involved intricate sewing techniques and in some cases even pattern cutting. That’s pretty impressive for a teenager! Model Scout Rebecca Morgan was on hand throughout the day to give the up-and-coming models advice and tips on making it in the industry and advised that budding models should be at least 5.8. 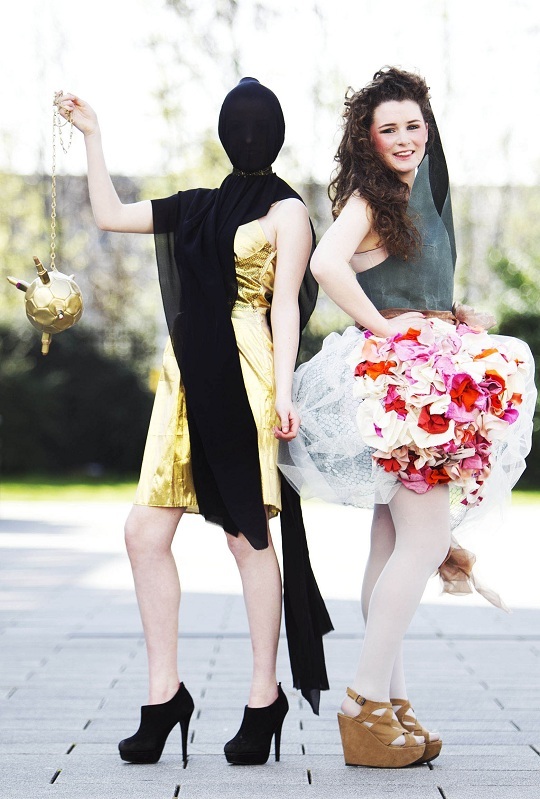 Six “Reinvent Fashion” finalists were chosen and their creations will take part in the Griffith College Creative Show in May, where the ultimate winner will be announced. One of my favourite outfits on the day was this GaGa-esque gold creation (left) on Megan Walsh made from a Christmas table cloth!